Those Hanson boys made this song a hit back in 1997, but someone is keeping it alive today. 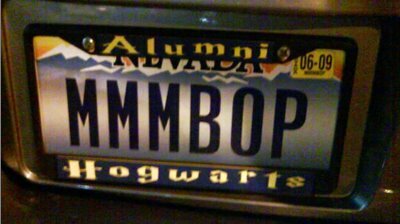 What’s even better is that this driver is also rocking a Hogwarts Alumni license plate frame. We aren’t 100% sure, but if we’d have to guess—we are almost certain this person gets made fun of on a daily basis. ~ by ASSMAN on April 26, 2010.